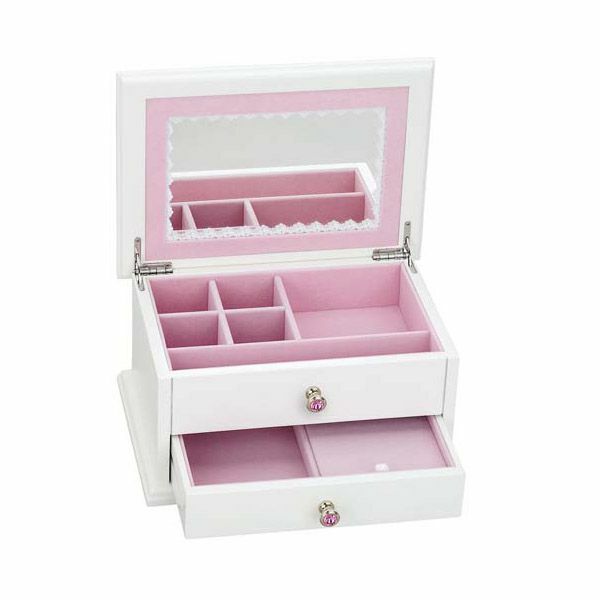 The Reed and Barton Secret Princess Girls Jewelry Chest is elegantly lined in a plush, soft pink velvet to gently store and protect special treasures dear to a young girl's heart. This spacious soft white chest showcases sparkling pink jeweled knobs and a mirror inside the lid, charmingly trimmed in pink velvet and lace. What is the secret part of this jewelry box? The secret is a covered compartment in the drawer to hide special treasures and secrets! This jewelry box is a wonderful gift for a birthday, holiday or to just say "I love you". Whatever the occasion, the Secret Princess jewelry box is sure to become a treasured keepsake for many years and when handled with care can be passed down for the next generation to enjoy. 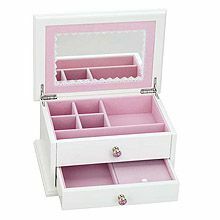 The Secret Princess jewelry box measures 9-3/4" by 7" by 4-1/4" and is gift-boxed for a favorite princess.